I’m thrilled to share the first of many book reviews here on For the Sake of Good Taste with today’s review of The Matrimonial Advertisement by Mimi Matthews. I received an ARC of Mimi Matthews’ The Matrimonial Advertisement through Historical Fiction Virtual Book Tours for review purposes. As always, this review reflects only my honest opinions on the book. I’ve been very picky about my book choices as of late, but I’m almost always down for a good historical romance (my love of Philippa Gregory’s Tudor-era novels should make that pretty clear!). 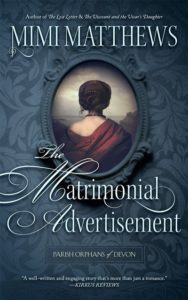 I was unfamiliar with Matthews’ work before joining this blog tour, but I can confidently say that I’m very much a fan since reading The Matrimonial Advertisement. The book quickly drew me in with a Victorian-era setting on the coast of England. If you’re new to the blog, I lived in Somerset for a time and miss it terribly. Books might be the easiest way to get myself there until I’m able to return! I don’t think I’d have disliked the novel if it took place elsewhere, but I loved it all the more for this aspect. What really kept me intrigued, though, was The Matrimonial Advertisement’s characters and their mysterious individual backstories. Why is Helena so afraid? What dark secrets have forced Justin to put such emphasis on his gruff exterior? Beyond that, what secrets are they keeping from one another from the moment they meet? Matthews brings these questions to light time and again, giving both characters and readers a bit more insight each time around. Alongside these protagonists, The Matrimonial Advertisement features a cast of supporting characters that keeps you just as intrigued as the couple. From Helena’s longtime companion, Jenny, to the various characters at Greyfriar’s Abbey, I found myself as interested in the supporting cast as in the novel’s stars. Fortunately, the more interested I grew in these other characters, the more I could remind myself that this is the first of the Parish Orphans of Devon Series. There are more stories to come! I’m already excited about 2019’s Book 2, A Modest Independence. Mimi Matthews (A Victorian Lady’s Guide to Fashion and Beauty, The Lost Letter) writes both historical non-fiction and traditional historical romances set in Victorian England. Her articles on nineteenth-century history have been published on various academic and historic sites, including the Victorian Web and the Journal of Victorian Culture, and are also syndicated weekly at BUST Magazine. In her other life, Mimi is an attorney. She resides in California with her family, which includes an Andalusian dressage horse, two Shelties, and two Siamese cats. HAS OUR REVIEW OF THE MATRIMONIAL ADVERTISEMENT* BY MIMI MATTHEWS CONVINCED YOU TO PICK IT UP FOR YOURSELF?